Richard Lippold (1915-2002) was born and raised in Milwaukee, and studied industrial design at the Art Institute of Chicago. He returned to Milwaukee for a brief period, teaching art at the Layton School of Art, eventually winding up in New York. His works are featured in such prominent places as the Metropolitan Museum of Art and Avery Fisher Hall in New York, and the Air and Space Museum in Washington, D.C. 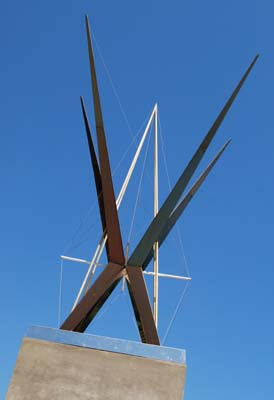 The piece above is "Ex Statis", and sits in front of the Alumni Memorial Union at Marquette University, originally shown in Venice in 1988. What an interesting piece of sculpture.